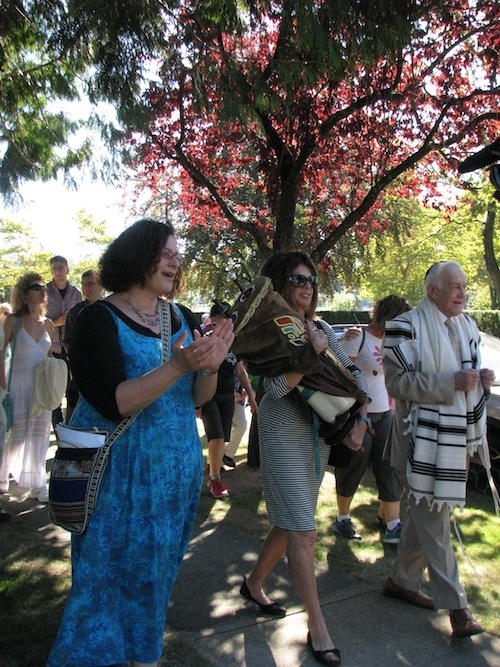 The energy was palpable last Sunday, Sept. 14, as congregants from Vancouver’s oldest Conservative synagogue gathered outside the Jewish Community Centre of Greater Vancouver. Everything was ready for the procession. The ark, which had been rolled out of its temporary home in JCCGV’s senior centre sat nearby, housing the synagogue’s three Torahs. Congregants were dressed in their best sun hats, and everyone had their walking shoes on. 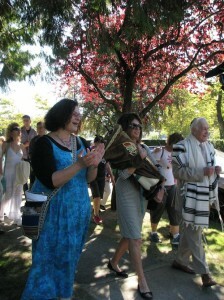 Even Vancouver’s weather was cooperating, with warm temperatures set for the unprecedented celebration. The members of Congregation Beth Israel, who had trepidatiously turned their synagogue over to architects and builders almost two years ago, were ready to return home. A little more than a kilometre away, a new building sat in the final stages of construction, with a new address and a sweeping landscaped entrance facing the quieter side street. The makeover, which had been more than a decade in planning, was coming to fruition. For the congregation’s 630-plus families, its upgrade represents more than the loving reconstruction of a 1940s landmark. 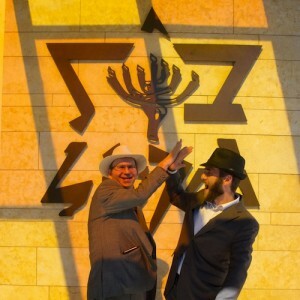 As BI president Peter Lutsky lightheartedly said, the makeover is BI’s latest stage in “re-jew-venation,” a process that has been a part of the synagogue’s life and identity since the 1970s, when the first major retrofit took place to accommodate an aging building and a burgeoning membership. 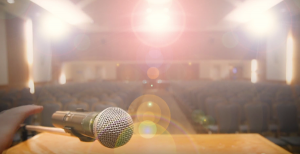 And it’s a process, said Lutsky, that has built itself upon the congregation’s belief that more than 80 years after its founding, it can still transform itself to meet new needs and new perspectives of what makes a Conservative Jewish community. 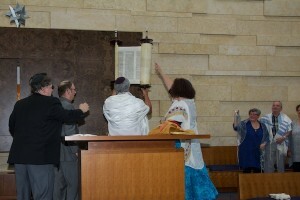 For today’s BI community, said Rabbi Jonathan Infeld, that concept is embodied by its inclusiveness; a divergence from the synagogue’s earlier image when elevators were added “as an afterthought,” where the bima towered high above the congregants and families had to decide between the responsibilities of child-minding and the desire to attend services. Those elements have now been factored into the synagogue’s structure. “We have a play-and-pray space right next to the sanctuary so that young families will be able to have their children playing in a room that is right next to the sanctuary,” said Infeld. It’s a vision that keeps pace with today’s Canadian concepts of inclusiveness as well, in which mobility needs don’t restrict one’s ability to participate in community. All areas are physically accessible, including the bima, which is set low to the ground. “This is certainly part of our consciousness: making sure everyone feels welcome and is able to enter and utilize the building is certainly important,” Infeld explained. Getting to this point, however, has taken much more than planning. It’s taken constant fundraising, almost all of which has been raised within the BI community. “We’ve raised over $16 million from our Beth Israel community,” much of which was done, said Lutsky, through the strength and dedication of its fundraisers, who applied themselves round the clock for years to raising the necessary capital for each stage of the reconstruction. He likened each gradual success to completing “another link in the chain” of progress. Lutsky credited Gary Averbach, who spearheaded the capital campaign, and Shannon Etkin, the synagogue’s executive director, for the far-sightedness that allowed the congregation to raise the funds and, at the same time, meet the opening deadline on time, with a Torah procession and a gala dinner to follow. Later, Etkin told the Jewish Independent that the day went on without a hitch, with some 400 people at the opening, and a sold-out 500-seat dinner. Cantor Lawrence Szenes-Strauss said that, from his perspective, the greatest takeaway from the opening was the engagement he saw on people’s faces as they accompanied the Torahs the last block and a half to the shul. 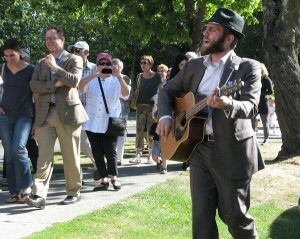 Due to the distance from the JCCGV, the Torahs were accompanied to two vehicles in the JCCGV parking lot, and then escorted by car to the corner of Willow and 28th, where the community reunited and joined in song the rest of the way to the shul. “It was fun,” he said. “People were excited. [They] were dancing all the way up there; it’s the way it ought to be.” He said he hoped the excitement that he saw would carry forth into future events as the community settled into its new surroundings.